I hadn't realised just how badly Destiny needed private competitive matches until today, when Bungie added them to the game. I also hadn't realised how much fun I'd have going up against my friends. Above: What true friendship looks like. As of today — almost two full years after Destiny launched — it's finally possible to put together a private match with your friends. As far as options go, you can pick the game type, the score limit, the time limit, the map, and whether or not you want your light levels to be normalised and balanced. Shortly after private matches went live, my buddy Mike and I jumped into a 1v1 game of mayhem rumble. I was immediately laughing my arse off. 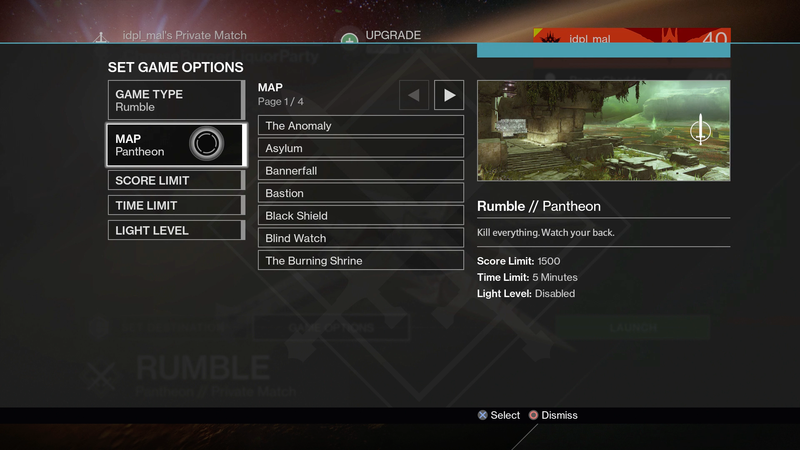 Soon our fellow raid-buddy Russ hopped in and we played a few rounds of three-player non-mayhem rumble. This'll be huge for training. A few people could easily use private matches to run practice skirmishes, coordinate formations, and do other high-level practice, which will doubtless come in very handy during competitive events like the Trials of Osiris. It will also be helpful for testing weapons and determining how everything works. Destiny has long has a dedicated community of people who put guns through their paces in PvP, and the ability to set up private "test zones" will almost certainly help them gather more and better data. It's easy to call audibles on the fly. At one point our mayhem game started getting weird because of how much heavy ammo was around, so we all agreed not to use heavy for the rest of the match. It'd be possible to come up with much more complicated custom rule-sets, as well. It's a great way to kill time. If you have a half-hour to kill before your sixth party member can come raid, a few custom rumble matches will be a great way to kill time. If your friend is ready early, you can just stop the match and go play. You're not beholden to anyone but yourself and the other players. There's something refreshingly casual about that. It will make high-level play much easier to organise. Today's 6v6 MLG exhibition got a lot of hype, but it's really only the beginning. Designed to showcase new maps and a new mode, the event felt as much promotional as it did truly competitive. As many predicted ahead of time, Alpha team (with players like SirDimetrious, Luminosity and TripleWRECK) generally outplayed Bravo team (which featured TrueVanguard, nKutch and RealKraftyy, among others). 12 players was a lot to keep track of, but I'm very excited to watch some custom matches in 3v3 game modes like elimination. Watching high-level Destiny streams is about to get a lot more fun, particularly during the week when Trials of Osiris isn't happening. I remember how much fun I had playing split-screen Halo in college, but all the same I didn't anticipate how well that would carry over to Destiny, or how much I'd enjoy going head-to-head with the friends I've spent so many hours cooperatively fighting alongside. This will obviously vary from person to person and from group to group, but our smack-talk was good-natured. More often than not, I laughed just as hard at the times I lost a 1v1 as I did at the times I won. 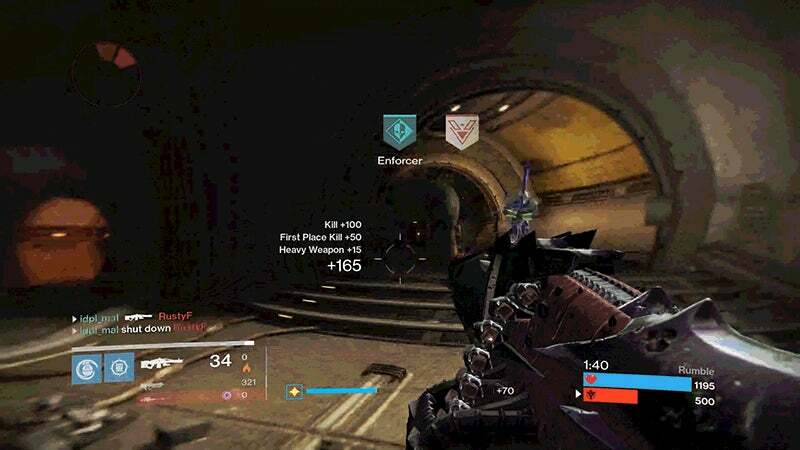 Destiny private matches have been overdue for a while now, and the amount of fun I've already had with them does make me wish Bungie could've added them to the game months or even years ago. That being said, my initial impressions are very positive. Better late than never. Brilliant stuff. Though sadly, for me, the only thing that showcase actually showcased was how overused and tedious shotguns have become in crucible (to say nothing of snipers). I was hoping there might have been a primary only choice in the custom matches. I look forward to trying to them out. I'm utterly terrible at pvp but love playing with friends so this is super exciting for me. Will be interesting to see if they introduce more crazy things for private matches (like in halo for instance) low grav, only rockets, etc. Obviously a bit harder with the level of customisation with people characters\weapon loadouts but could be fun.